The Young and the Restless (Y&R) spoilers update and recap for Wednesday, January 9, tease that Cane Ashby (Daniel Goddard) will read a difficult letter. It’ll be from Lily Ashby (Christel Khalil), who’s clearly struggling behind bars. Lily will acknowledge the tension she’s faced with Cane in their recent phone calls. She’ll admit it’s hard for her since they never talk about her current situation. Lily will feel like Cane tends to bring up the past and she’s just not that person anymore. She won’t be sure she’ll ever be that person again. Later, Charlie Ashby (Noah Alexander Gerry) and Mattie Ashby (Lexie Stevenson) will have an idea. They’ll think they should attend J.T. Hellstrom’s (Thad Luckinbill) memorial service as a family and support Reed Hellstrom (Tristan Lake Leabu). A nervous Cane will advise against it, but the twin won’t give up. Y&R spoilers say Cane will eventually cave in, so he’ll have to prepare for an awkward encounter with Victoria Newman (Amelia Heinle). Their steamy kiss will undoubtedly be on both their minds soon. In the meantime, Ana Hamilton (Loren Lott) will slip out of the penthouse and leave Devon Hamilton (Bryton James) a goodbye note. Fortunately, Dr. Nate Hastings (Brooks Darnell) will stop Ana from leaving. Devon will catch up with Ana later and offer an apology for lashing out at her. He’ll admit Ana was right about the song and push her to let him prove he can be a better brother. 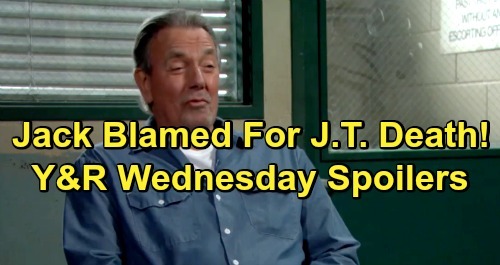 Over with Abby Newman (Melissa Ordway), she’ll catch Jack Abbott (Peter Bergman) reading about Victor Newman’s (Eric Braeden) arrest. Abby will pipe up that her dad’s innocent, but Jack won’t be so sure. However, he’ll insist on leaving that to the jury and skipping an argument with Abby. Afterward, Jack will pay Victor a visit to do some taunting. That’ll lead to a startling suggestion from Victor. He’ll think maybe Jack’s the one who’s framing him, but Jack will shut that thought down. He’ll insist that he wouldn’t kill J.T. or plant bloody proof. Jack will concede that Victor might be telling the truth about his innocence, but he’ll think the cops are going to take him down either way! Other Young and the Restless spoilers say Lola Rosales (Sasha Calle) will be a nervous wreck. Her anxiety will creep back in over her upcoming presentation with Devon. Kyle Abbott (Michael Mealor) will contend that Lola can get the job done. He’ll push this chef to believe in herself. Fortunately, Lola’s presentation will be a big hit. Devon will give Lola an advance with more money than she expected, so she’ll be over the moon. Once they’re alone, Kyle and Lola will have a sweet moment of happiness. He’ll tell her he loves her and she’ll say it right back. The Young and the Restless spoilers say things are looking up for “Kola,” but you can bet more drama’s ahead. We’ll give you updates as other Y&R news comes in. Stay tuned to the CBS soap and don’t forget to check CDL often for the latest Young and the Restless spoilers, updates, and news.